3 little beagles from Kentucky waddled their way through our door and straight into our hearts. They had been unceremoniously dumped by the same owner. 2 female beagles and 1 male. The male was the only one who came with a name, if you can even call "Bull" a name. And so we gave them names of famous Kentuckians! All 3 beagles tested Positive for Heartworm, but there were other concerns. They had been so badly neglected. Laura-Bell had a severe case of ear mites and a heartbreaking fear of people. Haven had ear mites too, along with some concerning mammary tumours, but she couldn't get enough cuddles. The oldest of the 3, Grandpa Louis, had a significant heart murmur in addition to the Heartworm. He couldn't get enough of the garbage can in the examination room. We lost precious Haven to cancer in May 2015. We lost shy little Laura-Bell to the same thing the following year. But she'd come a long way to loving cuddles as much as Haven had. And now, we've lost our Louie. A light has gone out at Sheba's Haven. Louis was the apple of Catherine's eye. He was also her Tiny Tim! Wherever he went, and he was always going somewhere, he would tiptoe there! Picture a butterball turkey doing a tiptoe through the tulips. That was sweet Louie. He also enjoyed a good bum paddle. "He loved his bum paddled. He would be' tiptoeing' by and I would say, I'm going to paddle your bum and he would stop in his tracks just so I could do it. Loved him to pieces." We will miss the Patriarch of our Kentucky Trio. This past weekend, I sadly attended the Memorial Service for a much loved friend and supporter of our beagle repair shop. Fred Schulz was an incredible man and a very wise teacher. Even at his Memorial, he was teaching us. Live life to the fullest. Make every day count. Be good to others. Love, Love, Love. What would we do without the people and the animals who inspire us to be better? I'll end these thoughts with a Welsh lullaby that was played at Fred's memorial. Listening to it felt a lot like a cuddle. Christmas came early for us at our 8th Annual BEAGLE BASH FOR CASH! We certainly decked the HOWLS with boughs of BEAGLES that day by raising enough to keep our doors open for 3 little wise beagles from Kentucky. We even managed to keep the door cracked open wide enough to welcome a beagle named Odie. 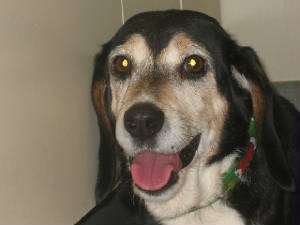 Odie is in the care of a shelter in Vaughan and will soon undergo surgery for a torn cruciate ligament. By Christmas, he will be lovingly waited on by his doting foster Mom who is already preparing for his arrival! As for our 3 Kentucky FINE chickens, they're all going HOME to their foster families this week - the girls having left earlier this afternoon! But here's where you come in. All 3 of these dear souls have Heartworm. Treatment is underway and we are so very hopeful for their return to health. Our thanks go out to the vet clinic in Kentucky who diligently worked with our vets to properly address their medical needs. We were fortunate on the timing of their rescue too, with mosquito season safely behind us. Big thanks also goes out to the Transport Team - many American volunteers who sacrificed their Thanksgiving to bring them HOME to us. If only Heartworm was the only concern. A thorough examination at our end of sweet little Haven revealed not one but several mammary tumours to worry over - something we cannot fully address until the Heartworm treatment is complete. And dear sweet lovable Louie has a significant heart murmur which may or may not be connected to the Heartworm. Aside from some heartbreaking scarring on her paws likely brought on by compulsive stress licking and of course, the Heartworm, shy little Laura-Bell is in good health! And all 3 are surprisingly in such good spirits despite all their troubles! But then again, why should we be surprised? Beagles are known for their happy spirit. So yes, my friends, we've got some serious stockings to fill this Christmas, with gifts that will last throughout the New Year! but would still like to make a donation for the HOWLidays, don't hesitate to delight us! and don't forget our perma-foster-beagles like Jerry Maguire and Carlton! Make your End-of-the-Year Donation here! Perhaps you'll want to make a donation in a loved one's honour! We'll send a card on your behalf! And, with a donation of $25 or more, we'll gladly include our First Edition 2014 Beagle Calendar (while supplies last)!!! Here's another idea and it's a really good one. Why not become a Monthly BOBefactor to start the New Year off with hoots & howls!? You'll be saving lives right along with us ALL YEAR LONG!!! We're busier than beagles at a Squirrel Convention preparing for our 8th Annual BEAGLE BASH FOR CASH this Sunday! until we learned that TIME is something these three dear souls don't have. That's when we did just what you would expect us to do. They were dumped at a pound in Kentucky by their owner. All 3 of them. Why? Because they're old. That's their crime. We never rescued any beagles from Kentucky before but time was running out and no other rescue had room. We reached out. Look at those faces. How could we not? They didn't come with names. Well, the male beagle was apparently called "Bull". We're hoping he's not that attached to it because we googled "Famous Kentuckians" and came up with beautiful new names for their new life with us! Country Musica Hall of Famer Grandpa Louis Marshall Jones, born exactly 100 years ago, was a banjo player from Niagra, Kentucky. He was also a cast member on HeeHaw! Born in Lexington, Kentucky in 1981, Laura Bell Bundy has become a Broadway actress and singer! and SongWriters Hall of Famer, Haven Gillespie, was born in Covington, Kentucky back in 1888. He wrote "Santa Claus is Coming to Town"!!! Give our 4-legged version of these famous Kentuckians a little time. They'll be playing banjo, hitting the stage and writing Christmas songs before you know it! Yep, if it wasn't for YOU, it could never come true..
Grandpa Louis, Laura-Bell & Haven are Coming to Town! I think they're gonna like it here, don't you?